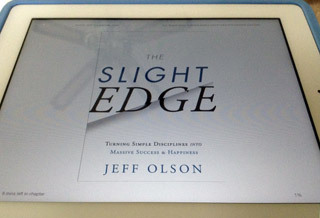 I picked up some great tips on non-fiction writing from an unlikely source: The Slight Edge, by Jeff Olson. It’s a self-help book on improving your career and your life. I rarely read self-help books. They’re usually helpful, no argument there, but I find they often take a simple idea that could be completely explained in a single blog post or pamphlet, and pad it to fill the length of a book. I usually get impatient. I’d rather read the executive summary, and get the gist in a few bullet points. I read this one, though, because it was recommended to me by someone who knows I’ve been job hunting, and thought it would be helpful. I didn’t think I needed help, particularly, but the recommendation was made earnestly, so I picked up a copy of the book. And it has been helpful, not only for the content, which is certainly interesting, but for the style. I found the book to be engaging, and I read it cover-to-cover, and as I did, I tried to parse out what about it kept me reading. Here are the tips that I picked up. There is one key idea in the book, which the author repeats and restates in each chapter, his idea of the “simple disciplines” that people should practice each day. Each chapter develops the idea more fully, but it truly could be distilled to the length of a blog post, easily. And yet, as I read the book, I started to see the the value of repetition, beyond just padding the content to a target length. When you’re learning a new skill or adopting a new behavior, it helps to come back to the same ideas day after day, reading a chapter, setting it down, and coming back to read some more. The repetition reinforced the message, and helped me start to internalize the idea. I think it helps to get to the point when the reader says, “Yeah, I know. I get it already.” It’s a lesson I learned long ago in teaching, and it makes sense that it’s just as useful a lesson in non-fiction. The author tells stories from his past, his career failures and successes, that show why he was motivated to write the book, and provide evidence for why he believes his ideas work. The anecdotes read, in tone, like the testimonials you might hear at a tent revival, although in his case, rather than starting out as a sinner, he started out mowing lawns for a golf course. And rather than finding spiritual enlightenment, he became a successful entrepreneur. But the thing is that it works. His own stories add a personal touch to the otherwise dry material. They offer humor and pathos that I found engaging and that kept me connected to the book. And, as usual, I find ideas are easier to remember when they’re couched in stories. And when the stories are emotional ones, that’s even more effective. The personal stories are also part of the book’s ongoing use of self-promotion. In each chapter you’re told why you’re doing the right thing by reading the book, and what value you’ll get from reading the book, or what you’ll miss out on if you don’t. In some cases, it’s the story of his own transformation that persuade you to keep reading. Other times he uses human, humble stories about famous people, like Michael Jordan not making his high school basketball team as a tenth grader, or Thomas Edison failing thousands of times before successfully inventing the light bulb. (If they can do it, so can you, as long as you learn the secret!) And he ends each chapter with notes from readers who were helped by the the book and wrote to say so. Shameless plugs? Yes, definitely. Interesting reading? Yep, that too. And at times he just uses persuasive language directly. Chapter 2, for example, ends with this message: “Whatever your deepest desires are in life, I want you to have them, and I know you can.” As transparent as it is, I found that kind of self-promotion to be compelling. I know the value of promoting my book to encourage people to buy it, and it only makes sense that promotion within the book would encourage people to keep reading. I know it kept me reading to see what he had to say in the next chapter, even though I recognized it for what it was. So, I’m glad I read the book. Sure, the content was useful, and that alone is a good reason to read the book. But I really appreciate the way the book was written, and I’m already incorporating what I learned into my next non-fiction project, which is not a self-help book, but which will be better for my having read this one.